In a busy city like Berling, even riding an ordinary bike around can become a bit of a chore. 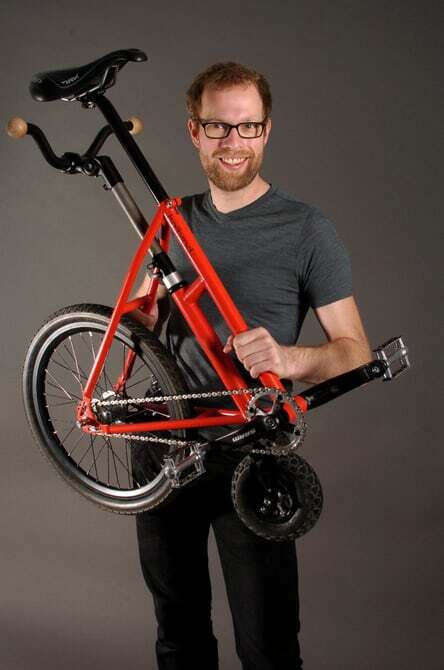 Berlin-based inventor Felix Kruschardt thought the same; so he literally halved the conventional bike to create what he called the Halbrad half bike. 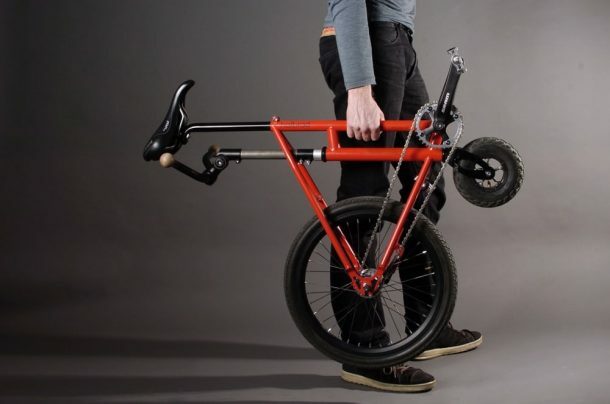 It is a simpler commuter bicycle, perfect for small city apartments and houses. Super compact in design, simply sit on the saddle, hold the handlebars below the saddle, and pedal away. 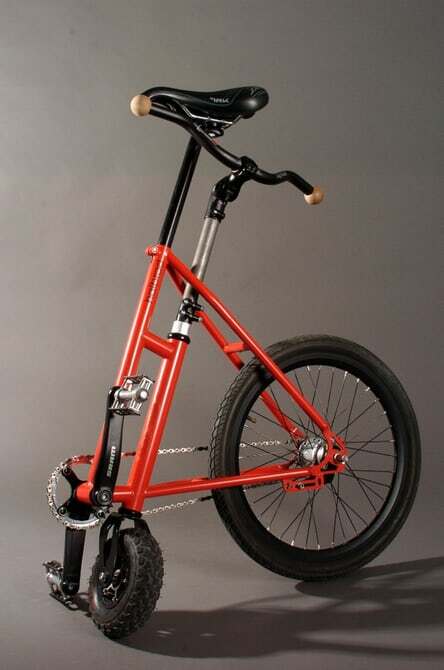 The bike is equipped with a small front wheel and a large rear wheel, and it is so small that it can be picked up and carried like a folding bike. 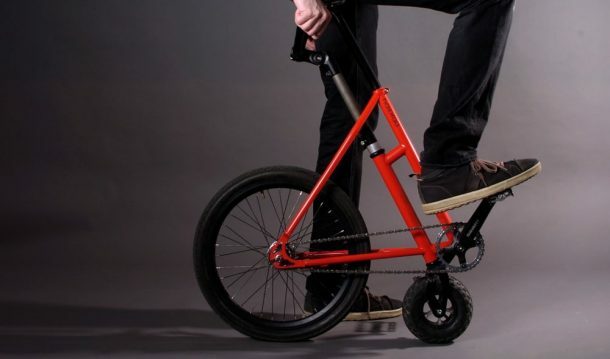 It has two-speed drivetrain and a single coaster brake. With a mere 35-in (90-cm) turning radius it is quite easy to manoeuvre and handle around the metropolis. It is just 39 in (99 cm) high by 31 in (79 cm) long. Weighing just under 20 lb (listed at 9kg), the Halbrad is perfect to be carried and transported on let’s say on a train or being kept inside an office. “It is very practical because it is very compact, you don’t need to fold it. It’s easy to just pick up and carry into the subway, at no extra cost. Also, it doesn’t take up much space in your apartment – and all of this without needing to fold it. It is very easy to use. You just put your foot on the pedal and off you go”. The inventor says that the only thing that bugs him is the position of the handlebar, which is placed behind the user. But he was also quick to point out that this doesn’t make much of a difference, and learning to use the bike is just a question of minutes. This is the second prototype of this fast, fun and practical design. The first one was made out of wood, and a lot of improvements and additions have been made since. Kruschardt hopes that he starts selling the product this year, but he still has to pass the bike as street legal under German law. This design has only one brake, while according to German regulations, the bikes must have two independent brakes. But other than this hitch, the idea sounds really cool and has the potential to be a real hit among the people. Would you like to have a ride on this new concept o a bike? Let us know in the comments’ section below!